It contains the orangey quilt, finally finished. Quilter’s Dream Wool this time and a real PLEASURE to quilt by machine, although it’s so puffy and soft that I only attempted loopy stippling to keep it fluffy. 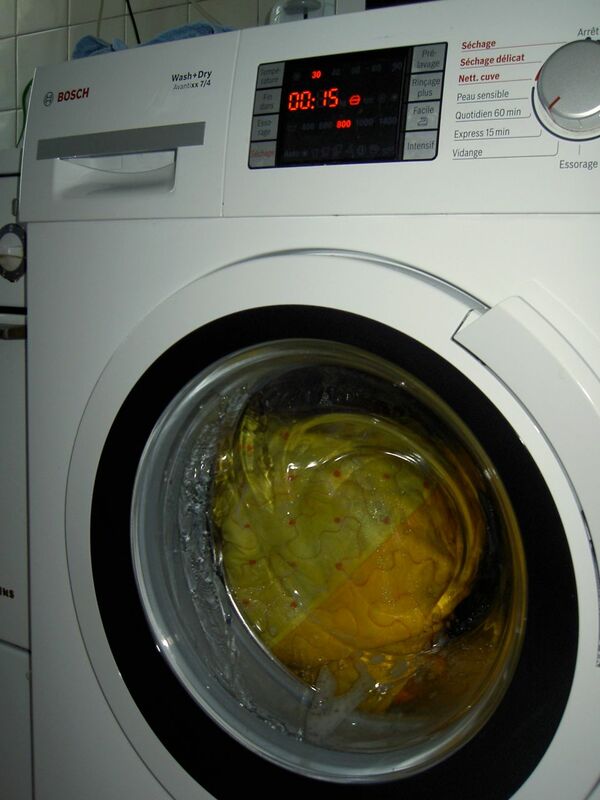 I wonder how it will survive the wash? It’s recipient is still off gallivanting in fieldwork, so I have a few more weeks to decide whether it is horrid or great. Bright, certainly, with a rather garish yellow pieced back. As an update to my previous post, Elita told me that the poly I had been using was also Quilter’s Dream, so I have no idea why I had the trouble I did with the pinky quilt. My dreams must only be made of natural fibers, I gather. I think my Pfaff must have some sort of deep-rooted Germanic ideological objection to artificial fibers — because it certainly coped beautifully with the thickness of the wool today. Kein Plastik mehr bei mir. Happy sewing last night with the local girls (there are some! they are lovely! 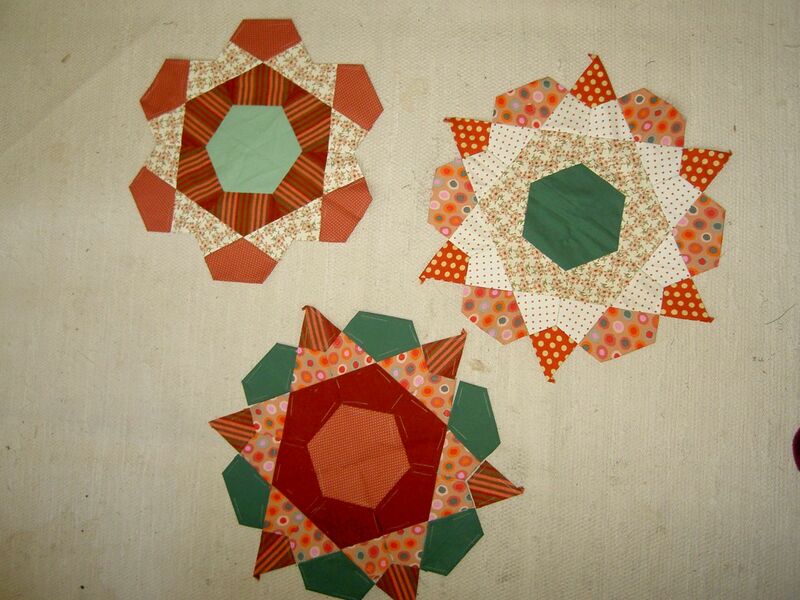 ), and I made some progress on my first attempt at Rose Stars. I’m just sewing each one as I go along, and I’m enjoying the unexpectedness of seeing how it all comes together, and how the colours blend and bounce off each other. Or not. I particularly like the darkest, bottom one. The one on the right still needs its ‘points’ sewn on, obviously. I’ll need to look for some creamy cotton, I suppose, to link them all up. On the summer holidays front, we just came back from a few days in the South of France, and the local market provided me with some fabric in pretty Provençal colours and patterns. 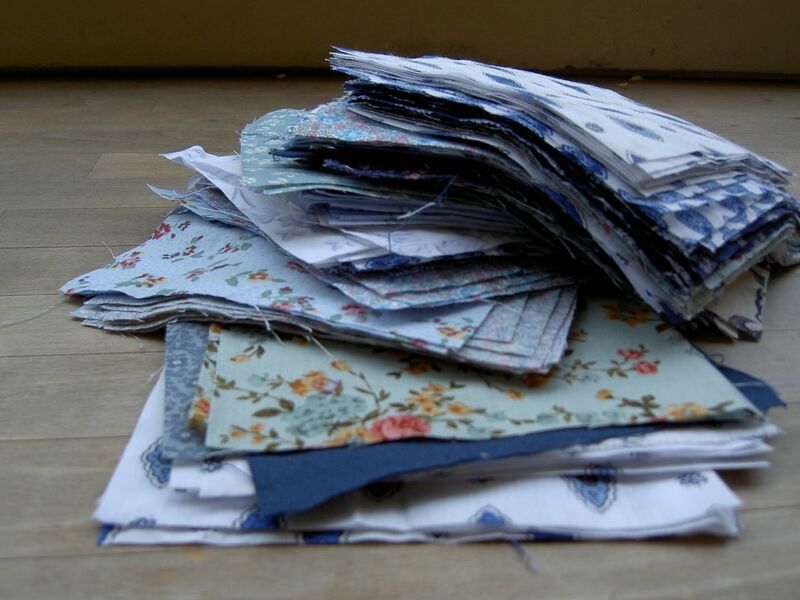 If I add them to the growing pile of blue 5″ squares, I should be able to make something fun. But what pattern to follow? 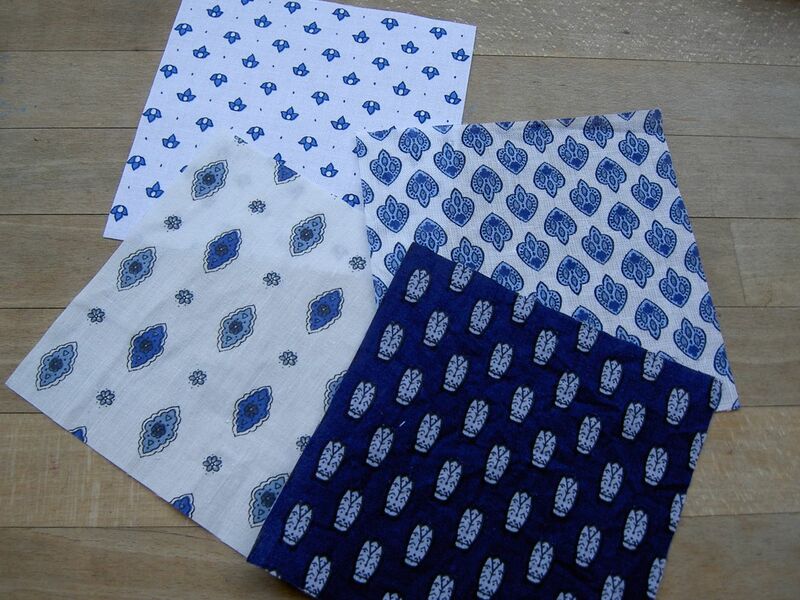 Possibly a return of the pattern used for Mr D’s quilt, maybe combined with white? It might work out as quite a nice jumble. I’m tempted to just sew them all together as random squares (quick satisfaction!) but it might be just a tad too busy. Or really charmingly-cottagey? Rich girl problems, methinks.